What’s the Number One Rule in Archive Storage? Home/Archive Storage, Blog/What’s the Number One Rule in Archive Storage? Safety…When you are passing over your most vital information and files you need to know that they will be safe. Safety is essential. Nowadays where most things are sent electronically and digitally we tend to forget about protecting and storing our paper based assetts and files. DataSpace UK know just how key this is and that is why we offer archive storage solutions to ensure that your data is safe and protected. It is the ideal storage solution for data such as patient files, x-rays and large scale plan diagrams as well as personal files. So what exactly should you know about archive storage? Well if you have files that need the optimum level of security you should be in the know as to how exactly they should be stored and protected. Document storing of this capacity should always adhere to the correct rules and regulations. It is vital that all your records are in an off-site area with round the clock CCTV. This should be monitored at all times. No exceptions. With bar code tracking systems in place it is easy to see where requests for files have been placed. It also means that files can be accessed for an easy return direct to you. If you are looking to store patient records from a hospital or a trust for example you want to make sure that there are no limits. Your files grow daily and you need to have the reassurance that you can keep them all in one place for easy accessibility. Files should be easily transported to you at your request. If you require your files more urgently then a rapid document access should be available to help you recieve scanned versions within an hour of your request. 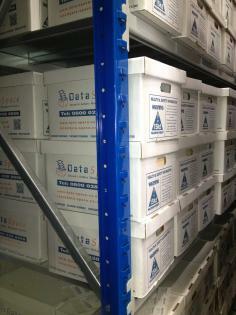 At DataSpace UK, we offer all of those services to provide you with a simple solution to archiving your files. We also offer a special fireproof safe so there really is no better place for your archives to be. Why not have a look at our website for more information about our archive storage solutions or any one of our other data services. You can also contact us directly on 0800 028 8956.